Gains in U.S. stocks will have to become broader soon for the current bull market to survive, according to Jonathan Krinsky, chief market technician at MKM Partners LLC. 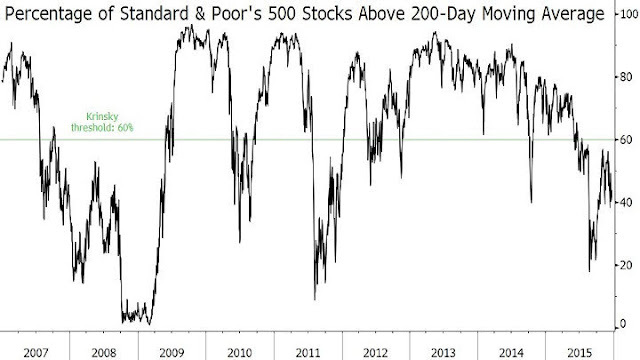 The chart below tracks the percentage of companies in the Standard & Poor’s 500 Index whose shares exceed their 200-day moving average. Having more than 60 percent of S&P 500 stocks above the average would be a favorable sign, Krinsky wrote. The New York-based analyst’s threshold is just below an average of 64 percent for the past 25 years. Readings have been lower than 60 percent since July 17. That’s the longest streak in about four years, according to Krinsky’s report. If it lasts through year-end, it would become the longest since May 2009, when the current bull market was only about two months old. Stocks may need a “Santa Claus rally” to produce broader gains, he wrote. By his reckoning, that didn’t happen last year. The S&P 500 fell 3 percent over the last five trading days of 2014 and the first two days of 2015.